This is the taco recipe was invented in the 1970s by a Scandanavian mother. It's quick, easy, inexpensive, and delicious. Make a note: these tacos are very mild. If you like your tacos spicy, add a jalapeno or two and use hot salsa. These tacos are made from a beef mixture with salsa and refried beans and chili powder. Fill crisp taco shells with cheese, lettuce, and sour cream. You could, of course, add other ingredients to this recipe. Try some guacamole or chopped avocado. Some pickled jalapeno peppers are a nice addition if you like a spicy kick in your tacos. Serve these tacos with some cold pop and beer, and perhaps some fresh fruit. In a large skillet over medium heat, cook the ground beef with the onion and garlic until the beef is browned, stirring to break up meat. Drain well. Add the refried beans, half of the salsa and the chili powder, to taste, to the beef mixture. Bring to a simmer over medium heat, stirring occasionally. Meanwhile, prepare the remaining ingredients. 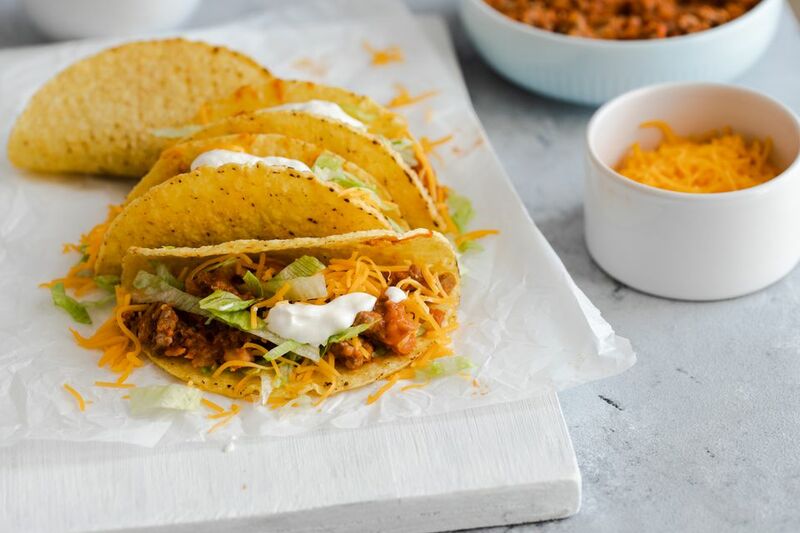 When the beef mixture is hot, put the taco shells on a baking sheet and bake them for 5 to 6 minutes, or according to package directions, until they are crisp. To assemble the tacos, place ground beef mixture in the bottom, then top with cheese, lettuce, more salsa, and sour cream. Swap out traditional salsa for pineapple salsa, pico de gallo, or a refreshing peach salsa. Add on a scoop of our simple guacamole for some delicious and nutritious flavor. If you're looking for an added zing to your tacos, try topping them off with some hot sauce. Frank's Red Hot, Cholula, and Tapatío are some great ready-made options for tacos. But, if you're looking for something that is more homemade, try this Mexican hot sauce recipe. Yum! For a slightly heartier meal with an earthier flavor, try adding sautéed, diced portobellos. If you're serving vegetarians, you can substitute the ground beef for the portobellos and have a great vegetarian option ready for your guests as well.